Conrad Kain is a titan amongst climbers in Canada and is well-known in mountaineering circles all over the world. His letters to Amelie Malek—a life-long friend—offer a candid view into the deepest thoughts of the Austrian mountain guide, and are a perfect complement to his autobiography, Where the Clouds Can Go. The 144 letters provide a unique and personal view of what it meant to immigrate to Canada in the early part of the twentieth century. Kain’s letters are ordered chronologically with annotations, keeping the sections in English untouched, while those in German have been carefully translated. Historians and mountain culture enthusiasts worldwide will appreciate Kain’s genius for description, his passion for nature, his opinions, and his musings about his life. Zac Robinson is a historian and assistant professor in the Faculty of Physical Education and Recreation at the University of Alberta in Edmonton. He currently serves as Vice-President for Mountain Culture for the Alpine Club of Canada. 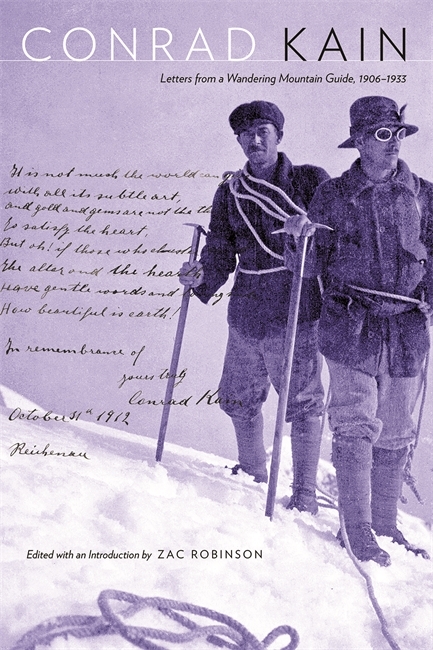 Austrian Conrad Kain....became a celebrated guide and mountaineer, claiming sixty-one ascents in the Rockies. Kain was what we have come to call an economic migrant, a poor man looking for better wages and a modicum of financial security.... Throughout Kain’s life abroad, the written word was as important as wages to his sustenance.... Spanning the time from just before he set off for Canada until just before his death, these letters reveal something of the immigrant experience, of the loneliness single men like Kain felt, the solace and sadness that news from home brought, and the desire to return, if only for a visit.